202 pages | 76 B/W Illus. With the rise of advanced computerized data collection systems, monitoring devices, and instrumentation technologies, large and complex datasets accrue as an inevitable part of biomedical enterprise. The availability of these massive amounts of data offers unprecedented opportunities to advance our understanding of underlying biological and physiological functions, structures, and dynamics. 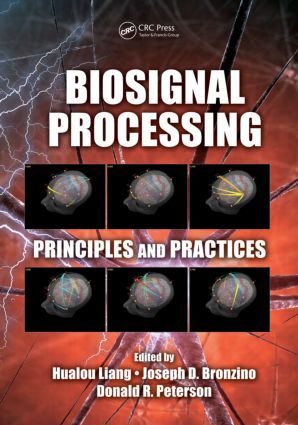 Biosignal Processing: Principles and Practices provides state-of-the-art coverage of contemporary methods in biosignal processing with an emphasis on brain signal analysis. After introducing the fundamentals, it presents emerging methods for brain signal processing, focusing on specific non-invasive imaging techniques such as electroencephalography (EEG), magnetoencephalography (MEG), magnetic resonance imaging (MRI), and functional near-infrared spectroscopy (fNIR). In addition, the book presents recent advances, reflecting the evolution of biosignal processing. As biomedical datasets grow larger and more complicated, the development and use of signal processing methods to analyze and interpret these data has become a matter of course. This book is one step in the development of biosignal analysis and is designed to stimulate new ideas and opportunities in the development of cutting-edge computational methods for biosignal processing.